Congratulations on a wonderful reading. I really enjoyed every minute of it. You have a wonderful droll take on the events in Squaw and you sense of humor shines through. Everyone was leaning forward, eager to hear the rest of your story. We’ve all been talking about it: Gill Dennis thought your writing was terrific. Louis Jones was talking about it yesterday at breakfast. The book, Eddy, is a great piece of writing that chronicles an extraordinary story about bigger-than-life, over-the-top movers and shakers in your two valleys. I knew some of the personae, but not all, and most of the events described were new to me. So it was a great read, full of success and failure, dreams achieved and smashed, elation and tears. And the story is not over, but the period you covered will probably be the most exciting, because it was a virginal landscape, with many strong-willed would-be players with different, opposing visions on what should be drawn on the unmarked palette. I’ve read a number of mountain resort histories, and yours is the best by far. You really know how to tell a story and hold the reader’s interest. Congratulations! 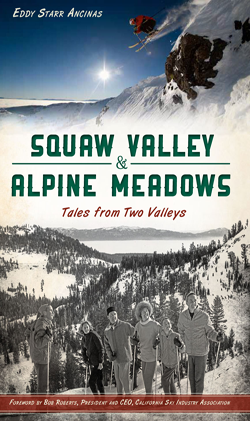 It was a great pleasure to read your fine Squaw and Alpine book – a real page turner. I was amazed how complete and balanced you were able to be. You seemed to have avoided getting opinions in the way of history. There are many stories about the collapse of the Arena, most claiming a conspiracy. I know your account is correct. The Olympic buildings were designed for 60 pounds per square foot, being ‘temporary.” The code at the time was 100#, over 200# per square foot now. The arena design was very clever with the waste heat from the ice making causing the roof to be slick. My guess is that the weight of snow when it collapsed was over 6,000,000 pounds, 3000 tons. Any machine would have been a small percentage of this, but maneuvering around the cables would have been tricky. I picked up the book in Truckee a couple of weeks ago and finally got time to sit down a fully read it. (of course when I first got it I looked to see the chapter on How to Buy an Olympic Village). I really enjoyed finding out so much more about the history of both areas. I knew some of the principal players via some contact, but it was so interesting to learn, for example, about Peter Klaussen’s history with both areas, I knew Peter and Joan but never knew the details that you brought out in your book. Great fun to read. Have not quite finished the book, but am loving it! Great memories. I have to tell you that my 9 years in SV were most impressionable and memorable. I still feel very connected to those beginning links to my life experience at Lake Tahoe. One of my best memories was walking my dogs along the meadow late afternoon after the sun set and watching all the horses run from one end of the Valley to the other. Truly special. Great book, you did a good job. I never really knew a lot about Squaw, very interesting. I took the past two nights to read Eddy’s book which I purchased from you yesterday afternoon. I think it is an important, delightful read. She has insights I haven’t found in some of the other books I’ve read about skiing in this region…and I have read almost all the books in her bibliography. Very well done and very enjoyable. Eddy, you write beautifully. I find your book a real page turner, and I am learning a lot I didn’t know, e.g., about my old buddy, John Reily. Well done. Perry (McKleroy-Alpine Meadows homeowner) enjoyed your book cover to cover. I have just started it. So happy that you took on a story that really needed telling. Dear Eddy, I opened a package from Henrik last week and was so pleased to find that it contained a copy of your new book. After all these years and thousands of skiers, you have no reason to remember us; but the Stockwells lived through all those years and events that you describe. Therefore it was hard not to open the book and harder to put it down until I’d read every word and poured over the photographs of friends and mountains. Your words took me back to the wonderful days in the Sierras.